The economical industry standard. Made of the same high-quality UV-stabilized polymers and rust-proof 304 stainless-steel wire used in our 1½” and 1” polytape. Far stronger than imports. A high strength plastic ratchet tensioner for use on polywire and polytape up to 1" wide. No need to cut material to tension it, just slide it in and turn for tension. 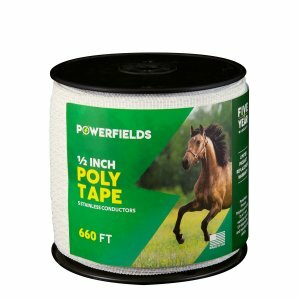 For joining rolls of ½" polytape or making repairs. It provides a positive electrical connection to insure good current flow. You should never tie knots in polytape to join rolls or make repairs as arching and reduced power will occur. Warns of electric fencing in use. Connects strands of Polytape together.